If a dog barks in the blogosphere…. | Will My Dog Hate Me? If a dog barks in the blogosphere…. If a dog barks in the blogosphere and no one hears him, did he make a sound? Not writing regularly about Frankie feels odd, especially since I’ve been having continuing problems with his insulin and I’ve been crazy worried. But without real solutions except tweaking the dose continually — it needs to be low enough so as not to cause hypoglycemia, but high enough so Frankie will feel well enough to eat — and trying to achieve a balance of food and exercise, there’s nothing helpful to report. My vet doesn’t know whether the Vetsulin is the problem — after all, it was taken off the market in the U.S., which is why I have to get it from Canada, where it’s the same formula that was taken off the market… — or if Frankie’s metabolism has changed with age. He’s nearly 13. No question, his sense of smell seems to be failing and his eyes are getting cloudier. To add to my worries, I’ve planned a trip to New York in early March relating to my Freud project. I have a lot of great contacts — including the director of Vienna’s Freud Museum — to meet with and I can’t cancel. I’ve considered boarding Frankie at the vet’s office while I’m away, but that will make neither of us happy. The better solution: a retired nurse who is now a dog sitter will stay with him and — for an extra fee — even sleep on the mattress on the floor that he allows me to share with him, the better to monitor his symptoms. Too bad I can’t get Frankie his own diabetes-alert dog. I feel better. I hate dwelling on medical issues, canine or human, but now at least Frankie is back in the public eye, where he belongs. Like all reasonably successful bloggers, I am often offered free stuff. If it’s something I’m interested in, I say sure — with the caveat that there are no guarantees I’ll write about what I am sent, no matter what. Sometimes I’m indifferent about a product and don’t bother. What good does it do anyone to read a blah review? If I got something that I thought was dangerous, I would issue a warning about it, but that’s never happened. Sometimes I write really excited reviews, as with my William Wegman patterned super Crypton throw. NOse Offense for Pets Luckily, Frankie is generally nose-offense free, but he’s had a few intestinal incidents that have required mop ups. Odors under those circumstances have been known to linger, but not when this magic potion is sprayed in the vicinity. Best of all, it doesn’t cover up the odor with another odor; I’m allergic to perfumes and that would be (almost) worse than the original smell. Castor & Pollux, Organix dry and canned food. Frankie has always been a picky dog and when he isn’t feeling well because of high blood sugar the problem is exacerbated. And if he doesn’t eat, he can’t get insulin. I always keep a can of Organix food on hand to tempt him if he refuses his food, which tends to be home cooked these days; it almost invariably works. Yes, sometimes Frankie prefers Organix to even fresh chicken or hamburger! I don’t like to feed only canned soft food; it’s not good for the teeth and it’s expensive. And I’d given up kibble because Frankie has had several bouts of stomach problems with different high-quality brands. But I never kept him on Organix after I finished the first sample bag, which he seemed to love, unlike most kibble. So, in order to make things easy for my pet sitter, I just bought a bag of Organix weight control kibble, because it’s lower in fat and higher in fiber, and several cans of soft food. I am hoping that, by the time I leave, he will be fine with a combination of the two. Nature’s Variety, Instinct Raw Daily Boost Powder and Instinct Raw Boost Bites. As I discussed in a post about traveling with Frankie, I’ve become a fan of Stella & Chewy’s freeze-dried dehydrated raw food for the road and as a supplement to home cooked food when I’m at home — a supplement, because it’s expensive. I can’t speak to the rest of the Nature’s Variety line, but Frankie liked the Raw Boost lamb bites very much and he didn’t mind the Daily Boost Powder being added to his home cooked food — which is saying a lot. So I would definitely try the food if I saw it at the store where I get the Stella & Chewy’s patties if it was comparably unit priced. Whew. Talked about Frankie, praised products that deserve to be praised. My universe is a little better adjusted. The nice folks at NOse Offense for PETS have offered a 20% discount to readers of this blog on any purchase at NoseOffense.com for the next two weeks. There are two steps: 1) You have to ‘Like’ them on Facebook (NOse Offense for PETS) and 2) use the code willmy20 when checking out your purchase. Easy peasy! The offer ends on 3/12/12. By nice coincidence, I just saw that Life with Dogs was doing a giveaway for a Crypton throver. Check it out here. This morning, I heard a report on NPR how Febreze began odor-less but people wouldn’t buy it; they didn’t think it worked w/o a smell. I don’t want the smell – I want the odor gone (and yes, I am pretty accustomed to it but visitors not so); have orderred NOse Offense and will let you know what I think. Next, they need a Bark-less spray…LOL. Sorry to hear about Frankie – good to hear about him again – glad you have the RN dog sitter. That’s funny, Roberta. I heard the same report and thought the same thing! A perfume-y sent would NOT be a reward for me for cleaning. Oh, oh — I just updated the post because they’ve offered a discount: Maybe you can re-order (or order more)?? We were very surprised to hear the same thing when pitching our idea: many people thought the same thing: ‘we won’t know if it works if we don’t smell anything..’ I know that there are some products that claim they have ‘zero odor’, however, the first ingredient on the back of the bottle is ‘tracer scent’, so those that need to smell something can. However, this ‘tracer’ stays around much longer than they claim and lessens the strength of the odor counteractants, therefore, negating the whole purpose of eliminating odors without any additional fragrance.. Thank you, Roberta, for giving us a chance to rid your home of any smell! I just checked with our shipping department and your package was shipped yesterday afternoon. I’m curious to hear your feedback – please email us @ info@noseoffense.com when you’ve given us a spray or two. We are confident you will never reach for another odor eliminator! Oh, and I’ll pitch the ‘bark-less’ spray at our next meeting 🙂 Enjoy! I’m so sorry to hear the insulin issues continue. I hope things stabilize soon so that you can go on your trip with less worry. I won’t say without … because … well, I know how hard it must be. Hang in there. The retired nurse is quite a found. I am sure you will have a great trip to Vienna and Sir Frankie – at an age 13 and with the loudest bark in the blogosphere he more than earned his knighthood – is taken excellent care of. But what is wrong with the picture? It seems perfect to me …. The retired nurse has stayed with Frankie before, for a few days, but he was okay then, and it was a little harder to convince her to sleep on the mattress on the floor — rather than the guest room with the real bed… I’m only going to New York, not Vienna — (I fixed that in the post, where I left that fact out) this time! I hope to go one day. Sir Frankie thanks you for his title and he won’t argue that he has earned it! So sorry that you’ve been worried with Frankie. I know it’s hard to keep all the attention that he needs to stabilize his insulin. I hope your trip goes well and that Frankie stays healthy and doesn’t pine for you too much while you’re gone. My husband was just diagnosed with diabetes (strong family history) and we’re working to manage his diet so he can avoid insulin. 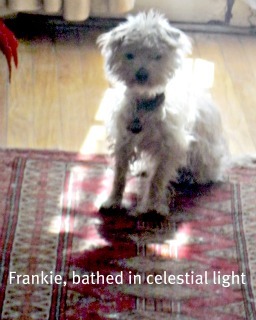 Can I tell him he’ll be bathed in a celestial ray of light if he keeps to his diet as well as you manage Frankie’s? Yes, do tell Dave that the heavens will shine on him if he sticks to his diet — and mention that humans with Type 2 diabetes have it better than dogs, who are almost always type 1 and without a no-insulin option (if you think he’ll find that too annoying, just stick with the first part). 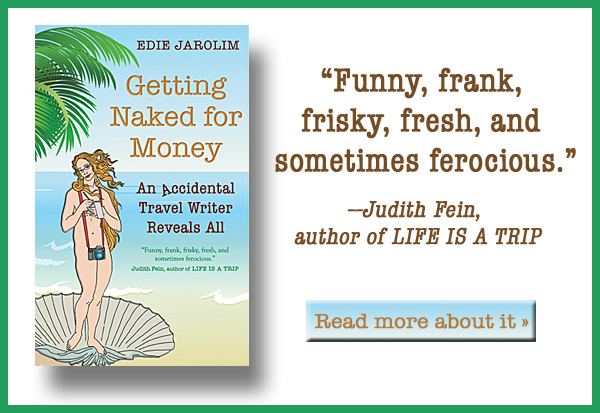 I am very glad to read about Frankie again. Though I am sorry he is not doing very well. I once met a cat who had his own hearing-assistance cat. She would alert him when there was food in the bowl or if someone was coming. It was very sweet to watch. Maybe Frankie could find a little dog friend that would help him out in a similar way. I’ve been curious about a lot of these freeze-dried raw diets for dogs. Unfortunately many of the brands I read about, such as Stella and Chewy’s, are not available in my local stores. We have difficulty finding a food that matches our dog’s high energy and and even harder time keeping her weight up. It sounds odd to say but high quality kibble just doesn’t contain the fat she seems to need. Good luck on your trip! I hope Frankie does well with the nurse and you have a great time. I love the idea of a hearing assistance cat for a cat but I’m afraid Frankie — and therefore I — would be so stressed by having another dog in the house that it would offset any benefits. I think Shiva is too big for the freeze dried diets anyway; they really are intended for little dogs and, especially, not for larger dogs that are very active like Shiva. She would probably need a bag every two or 3 days, at $30 a pop! Have you tried hamburger? I get the very low fat kind for Frankie but would go for the less expensive — ie., higher fat — kind if he could metabolize fat better. Thanks for your good wishes! Well, you know Frankie. He can meet someone dozens of times — or even be rescued by them — and not acknowledge any prior acquaintance. But I feel good that he will be in the comfort of home and in capable hands. I hope Frankie’s insulin is stabilized soon – I know how stressful that must be. Can’t wait to hear more about your trip to NY and the next steps in your Vienna project – sounds like you’ve found a great sitter for your little guy. Thanks, AJ. And yes, I’m pleased with Frankie’s caretaker though sorry for her at the same time. He’s such a whimsical little dog, in addition to having medical issues. You never know what he will or won’t want to do…. I was clearing my inbox—filing and deleting—and found an email announcing this post. Somehow I missed it. I’m so sorry to hear about Frankie. I know how gut wrenching it is when our dogs aren’t feeling well—and having to travel to boot. Oy. I gather from this post that you went to Vienna? I’m looking forward to the continuing saga and Freud and dogs. I will pray for Frankie. Hope its still worthwhile to be give my handful care to such a very good friend. Good luck to your next trip.